Time was when a Bonnie ‘Prince’ Billy couldn’t release a record or even sing a note without being called out for extensive morbidity. His songs were sad “sad” and his records were “heartbreaking”. Well now he’s got a record that’ll break your nose, too! That record is available to one and all today — rush down to the sounds shop and make your score. The record is called Summer in the Southeast which sounds sweet enough, don’t it? Sure it is — but it’s the kind of sweetness that only comes out after dark. Yeah, the live show sweetness! With the help of an all-star group of players (we won’t name names, for everybody is a star in this band), Bonnie recreates seventeen B’P’B classics tricked out in all-new duds — duds of silver, duds of pink, duds of bright blue velveteen! Together with the audience, Bonnie & Co. make these songs sing and soar as though they hadn’t previously (which they did, but nowhere like this!). Another word for the alchemy of this record is called rock and roll, hard and heavy — with no prisoners taken. Don’t worry, all you pussies — he does a bit of balladeering as well, and sure, it’s sensual and gets us hard and makes us cry. But why cry when you can scream? Find out for yourself with your very own copy of Summer in the Southeast — in silver-lettered CD format or pink-lettered double-vinyl. 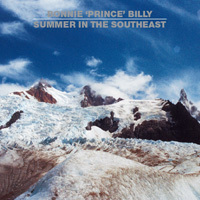 The Bonnie army spreads the word —Summer in the Southeast is a monster!